Was Russia warplane downing an overreaction? Who are the Turkmen in Syria? When Russian and US jets came into close proximity over Syria early last month, the Pentagon and the White House were swift to condemn. "Wreckless" and "irresponsible" were just some of the stiff words they used at the time. But now that Turkey has actually shot a Russian jet down, there is a tangible reluctance to up the ante, and a scramble to lower the temperature. Caution is the name of the game, with the Pentagon spokesman, Peter Cook, still saying that the US cannot definitively conclude that Turkish airspace has been compromised. As a Nato member, Turkey will expect the US and others to back its actions; but with Russia crucial to the prospects of pushing forward a political solution in Syria, de-escalation is the watch word on everyone's lips. When asked whether the US knows whether the Russian warplane was shot down over Turkey or Syria, Pentagon spokesman Peter Cook said US officers were "not able to conclude definitely right now where the aircraft were". Echoing those remarks, in an email to the BBC's Gary O'Donoghue, Col Steve Warren, spokesman for the US-led coalition fighting IS, said they were "still analysing the data from the radar tracks". The US Department of Defense press conference has begun, hosted by spokesman Peter Cook. The BBC's Gary O'Donoghue has provided some updates from Washington. The Turkish energy minister, Berat Albayrak, has said that the downing of the Russian warplane does not constitute a threat to energy ties between the two countries. Turkey is the second biggest purchaser of Russian gas products, according to Gazprom statistics. We are expecting a press conference with US Department of Defense Spokesman Peter Cook from the Pentagon around 14:30 local time (19:30 GMT). The BBC's Gary O'Donoghue will be providing updates and analysis on Twitter and this page. One of the two pilots in the shot-down war plane was killed by gunfire from the ground as he parachuted from the crashing jet, the Russian military has confirmed. Speaking on Russian state TV, Lieutenant General Sergei Rudskoy also said that Turkish aircraft had violated Syrian airspace when it shot down the warplane. As we reported earlier, Russian military officials have also said that Syrian rebels fired on a Russian search and rescue helicopter, forcing it to land and killing one crew member. BBC Monitoring says that the Russian Defence Ministry has issued a statement saying it will step up its operations in Syria, and "discontinue" military contact with Turkey. Reading the statement on state TV, Lieutenant General Sergey Rudskoy said "measures will be taken to strengthen air defence" and that "any targets representing a potential danger for us will be destroyed". He said additional weapons will be deployed to the Latakia area. Writing in Vox, Max Fisher has a counterargument for some of the more apocalyptic assessments of today's events. He says there is little chance of it sparking a wider conflict. Quote Message: The stakes are just too low. The things at issue here are Russia's bombing of anti-Assad rebels in Syria, the sanctity of Turkish airspace, and the life of one (or possibly two) Russian pilot. Those things matter, and Turkey cares an awful lot about its airspace and about what happens in Syria. But Russia doesn't care enough about those things to risk a major war. And neither do the leading members of Nato (the US, UK, France, etc), which will largely decide how Nato responds. There is thus every reason to believe that both Russia and Nato will seek to de-escalate." The stakes are just too low. The things at issue here are Russia's bombing of anti-Assad rebels in Syria, the sanctity of Turkish airspace, and the life of one (or possibly two) Russian pilot. Those things matter, and Turkey cares an awful lot about its airspace and about what happens in Syria. But Russia doesn't care enough about those things to risk a major war. And neither do the leading members of Nato (the US, UK, France, etc), which will largely decide how Nato responds. There is thus every reason to believe that both Russia and Nato will seek to de-escalate." The Russian soldier killed during a search and rescue mission for the crew of the shot-down warplane was on board a helicopter downed by rebel fire, Russia's military has said. A military spokesman said it was one of two helicopters taking part in the operation. The rest of the crew were evacuated and taken to the air base used by Russia in Syria. In the last few minutes, Nato Secretary General Jens Stoltenberg has been making a statement in Brussels. The Nato chief has backed Turkey's version of the story, and said that an allied assessment shows that the Russian warplane did fly into Turkish airspace. He said that there had been contact between officials in Moscow and Ankara, but not between Nato officials and Russia. Mr Stoltenberg called for calm and for the parties to deescalate the situation. A Russian soldier has been killed in the search for the pilots of the downed jet in Syria, the Russian military says. In his first reaction to his forces' downing of a Russian jet, Turkish President Recep Tayyip Erdogan said "everyone should respect the right of Turkey to defend its borders". Alpaslan Celik, a deputy commander in a Syrian Turkmen brigade, holds the handles of what is believed to be part of a parachute used when the Russian warplane was shot down. Echoing some of Mr Obama's comments, Francois Hollande said "we must prevent an escalation that would be extremely damaging. "The only purpose is to fight against terrorism and Daesh (Islamic State). "What took place means that we must find a solution to the Syrian crisis, otherwise there are risks of escalation." The president adds that he will be travelling to Russia this week. "I do think this points to an ongoing problem with Russian operations (in Syria)," Mr Obama continued, "in the sense that they are operating very close to a Turkish border and they are going after moderate opposition." "If Russia is directing its energies towards Daesh and Isil (Islamic State), some of those conflicts or potentials for mistakes or escalation are less likely to occur." Asked about the downing of a Russian jet, President Obama said he was still getting the details. But he said "Turkey, like every country, has the right to defend its territory and its airspace". He went on to say it was important for the Russians and Turks to talk to each other and take measures to "discourage escalation". UN Secretary General Ban Ki-moon says he is "seriously concerned" about the downing of the Russian jet and has appealed to all parties to urgently de-escalate, Reuters reports. In a letter to the UN security council and Secretary General Ban Ki-moon, Turkey's UN ambassador Halit Cevik said two planes approached Turkish airspace on Tuesday morning. He said they were warned 10 times in five minutes to change direction. "Following the violation, plane one left Turkish national airspace. Plane two was fired at while in Turkish national airspace by Turkish F-16s performing air combat patrolling in the area," Mr Cevik wrote in a letter, Reuters reports. "Plane two crashed onto the Syria side of the Turkish-Syrian border," he said. Russian President Vladimir Putin has said the fighter jet was attacked when it was nearly a mile inside Syria and has warned of "serious consequences". We are following a live statement from President Obama, who is speaking after talks with French counterpart Francois Hollande. The president has not commented yet on the downing of a Russian jet, but said the two men agreed that "Russian strikes against moderate (Syrian) opposition only bolsters the Assad regime, whose brutality has helped fuel the rise of Isil (Islamic State)". The Russian Defence Ministry website has more details on the Sukhoi Su-24 jet, the type shot down by Turkey. It is primarily used as an all-weather, low-level bombing aircraft. Barely distinguishable, but this still taken from Turkish television appears to show two parachutes after the Russian jet was shot down. The downing of the Russian airliner by IS, and Moscow's onslaught against IS targets appeared to suggest that Russia, the West and the moderate Arab states were coming into alignment. But as the Russian air attacks against Turkmen positions show, Moscow is still intent on bolstering the Assad regime against some of its other opponents, whatever may be happening on the counter-IS front. Turkey is deeply hostile to the Syrian regime and wants to see the back of Bashar al-Assad as soon as possible. So in this sense it is at loggerheads with Moscow. Turkey, like Iran, the Saudis and the moderate Arab states, all have a stake in what kind of Syria emerges from this crisis - as, to an extent, does Russia. The US and its Western allies don't much like Mr Assad and see him as very much part of the problem, but their main battle is against IS. The operations of the Russian army were taking place in areas very close to Turkey's border, threatening its border security. Turkey noted its rules of engagement were in place and there would be no hesitation to implement them if a violation occurred. The area where Russian operations were being conducted was free of Islamic State and other terrorist groups and civilian Turkmen were being harmed. Military operations were causing more civilians to leave their homes. There was concern Russia's operations in that particular region could hurt Turkey's humanitarian efforts. British Prime Minister David Cameron has discussed the incident with his Turkish counterpart, Downing Street says. In it he encouraged the Turks and the Russians to have a "direct conversation" over the matter. Mr Cameron is due to make the case for British jets to carry out strikes in Syria on Thursday. The Russian Defence Ministry has summoned the Turkish embassy defence attache to make a protest, the ministry has said in a statement published on its website. "The Russian plane did not cross the Turkish border and operated exclusively against facilities in Syrian territory. We consider the actions of the Turkish Air Force to be an unfriendly act,"the statement reads [in Russian]. Germany's Foreign Minister, Frank-Walter Steinmeier, says he hopes the incident will not hamper fresh talks over the Syria crisis. "I hope first that both capitals start talks with each other and that second, both Ankara and Moscow are aware of the responsibility when it comes to reactions and couter-reactions," he says. Was Putin's speech a way of deflecting criticism? The BBC's Moscow Correspondent, Sarah Rainsford, has been considering President Putin's furious speech earlier, in which he called Turkish action a "stab in the back" and called them "accomplices of terrorists". Quote Message: This was tough language from an icy looking President Putin. Much of his comment was for domestic consumption. After all, Vladimir Putin launched airstrikes in Syria arguing that it would make Russia safer; instead, 224 people were blown out of the sky last month in a bomb attack. And now this. By rounding on Turkey he is in part deflecting any suggestion that his own policy has backfired. But he is clearly furious too and it’s not clear yet how that will translate into action." This was tough language from an icy looking President Putin. Much of his comment was for domestic consumption. After all, Vladimir Putin launched airstrikes in Syria arguing that it would make Russia safer; instead, 224 people were blown out of the sky last month in a bomb attack. And now this. By rounding on Turkey he is in part deflecting any suggestion that his own policy has backfired. But he is clearly furious too and it’s not clear yet how that will translate into action." Chechen leader Ramzan Kadyrov has promised Turkey will "regret what it has done for a very long time", in a statement posted on his Instagram page and quoted on the website of pro-Kremlin LifeNews. "Those who take every opportunity to talk about friendship and cooperation should not act so underhandedly," Mr Kadyrov added. A spokesman for the US-led coalition against Islamic State, Col Steve Warren says it can confirm that the Turks warned the Russian plane 10 times before shooting down the jet. The conflict in Syria has drawn in major global powers, supporting and opposing President Bashar al-Assad and the myriad rebel groups ranged against him. This shows the various factions at work and the territory where they operate. Here's a guide to where the key countries stand on the strategy regarding Syria. Turkey's President, Recep Tayyip Erdogan, is to chair a security summit later on Tuesday following the downing of the Russian fighter jet. It will be attended by armed forces and intelligence chiefs. To put the previous posts in context, a sharp reduction in Russian tourists visiting Turkey could have a big impact. Recent figures from the Turkish authorities suggest Russians are the second biggest visitors by nationality. Natali Tours, one of Russia's largest tour operators, has suspended the sale of package holidays to Turkey,news website Gazeta.rureports [in Russian]. According to a press release from the company, the decision is based on President Vladimir Putin's decree of 8 November announcing measures aimed at "ensuring the safety of Russian citizens". Russian Foreign Minister Sergei Lavrov has advised Russians not to visit Turkey and said the threat of terrorism there was the no less than in Egypt, where a Russian passenger plane was brought down last month. Our colleagues at BBC Monitoring have been taking a look at the Turkmen, with fighters from the community claiming they shot dead the two fighters who ejected from the downed Russian plane. Who are they? Ethnic Turks who have lived in the region of Syria, Iraq and Iran since the 11th century. They are estimated to number between 1.5m and 3.5m. What is their role in Syria? Trained by Turkey, the Syrian Turkmen Brigades are about 10,000 strong and were set up in 2012 as the civil war in Syria took hold. Who are their allies/enemies? Their main opponents are the regular Syrian army and the Islamic State militant group. Some units have allied with Kurdish fighters. Russian Foreign Minister Sergei Lavrov has cancelled a visit to Turkey on Wednesday, agencies report. Quote Message: They already broadcast on Turkish television the radar images of the Turkish general staff showing how the plane penetrated Turkish airspace, and how it remained in Turkish airspace despite warnings." They already broadcast on Turkish television the radar images of the Turkish general staff showing how the plane penetrated Turkish airspace, and how it remained in Turkish airspace despite warnings." Moscow insists its plane never strayed from Syrian airspace. Quote Message: Both of the pilots were retrieved dead. Our comrades opened fire into the air and they died in the air." Both of the pilots were retrieved dead. Our comrades opened fire into the air and they died in the air." The deputy commander of a Turkmen brigade in Syria says his forces shot dead two pilots of the downed Russian jet as they descended with parachutes, says Reuters. Apologies, we earlier published a picture of what appeared to be the downing of the Russian jet provided by the AFP news agency. They have since said it was provided at another time. Russia's defence ministry said the two pilots parachuted from the plane but added that Moscow had no further contact with them. Rebels said they fired at the pair as they ejected. Video footage has shown what appears to be the dead body of one of the flyers, surrounded by armed rebels. Russia's consulate in Istanbul and the Turkish Embassy in Moscow have both seen protests. In another development, there are reports that a Russian military helicopter was forced to make an emergency landing after coming under fire from Syrian rebels. According to the Syrian Observatory for Human Rights, the aircraft managed to reach nearby government-held territory in the north-eastern Latakia region. Turkish Prime Minister Ahmet Davutoglu has defended the shooting down of a Russian fighter jet, saying it was their "national duty to take any measure against whoever violates our air or land borders". Turkish officials say its foreign ministry has summoned US, Russian, French, Chinese and British envoys to brief them on the downing of the Russian jet, according to Reuters. Mr Putin ended his speech by suggesting Turkey wanted Nato "to serve" IS. He earlier described the Turks as "accomplices of terrorists". Quote Message: Instead of contacting us, Turkey went to its partners in Nato to discuss this incident. As if it was us who downed a Turkish plane, and not vice versa. What? They want to make Nato serve IS?" Instead of contacting us, Turkey went to its partners in Nato to discuss this incident. As if it was us who downed a Turkish plane, and not vice versa. What? They want to make Nato serve IS?" Mr Putin said: "We will analyse everything in detail and today's tragic events will have significant consequences including for relations between Russia and Turkey." He said the aircraft was inside Syrian airspace - 4km from the Turkish border - when it was hit, news agencies report. Russian President Vladimir Putin has called the downing of a Russian jet at the Turkey-Syria border "a stab in the back by the accomplices of terrorists". He was speaking live on state-owned TV channel Rossiya 24. "It was bound to happen", he says. "We are talking about tight airspace and tight territory where the air raids were being conducted. "Sooner or later the Russian planes would get into the Turkish airspace." Sam Greene, director of the King's Russia Institute at King's College London, offers his insight on Putin's to-do list and how today's events figure in terms of priorities. Here's the statement from the Russian Ministry of Defence website. The website includes reports on the Russian air operation in Syria which it describes as a "retaliatory operation aimed at elimination of leaders of terrorist organisations and their allies, disruption of control and supply systems, as well as destruction of the ISIS military and oil and gas production facilities". A Syrian rebel group says one of the Russian pilots who ejected from his downed warplane was dead on landing. AP quotes Jahed Ahmad of the 10th Brigade in the Coast as saying the two Russian crew members had tried to parachute into a government-held area after they ejected, but came under fire from members of his group. Earlier, Reuters reported it had seen video from a rebel group that appeared to show one of the pilots immobile and badly wounded on the ground. AFP news agency is reporting that Nato has called an "extraordinary meeting" after the shooting down of the Russian jet. "At the request of Turkey, the North Atlantic Council will hold an extraordinary meeting at 16:00 GMT. The aim of this extraordinary NAC is for Turkey to inform Allies about the downing of a Russian airplane," an alliance official told AFP. This is the first time a Nato member's armed forces have downed a Russian or Soviet military aircraft since the 1950s, according to the Reuters news agency. A UK Foreign Office spokeswoman has described the shooting down of a Russian air force jet near the Turkish-Syrian border as a "very serious incident". She said: "We are seeking further details urgently. Clearly this is a very serious incident but it would be unwise to comment further until we have more certainty on the facts." Oil prices have risen following news that Turkey shot down a Russian warplane near the Syria-Turkey border and a weaker US dollar provided incentive for investors to buy more oil. "News of a military jet crashing in Syria is a reminder that there is still substantial risk in the Middle East," Bjarne Schieldrop, the Olso-based chief commodities analyst at SEB bank told Reuters news agency. Russian aircraft have flown hundreds of sorties over northern Syria since September. Moscow says they have targeted only "terrorists", but activists say its strikes have mainly hit Western-backed rebel groups. Turkey, a vehement opponent of Syria's president, has warned against violations of its airspace by Russian and Syrian aircraft. Last month, Ankara said Turkish F-16s had intercepted a Russian jet that crossed its border, and two Turkish jets had been harassed by an unidentified Mig-29. HaberTurk TV Channel releases footage showing a burning plane plummeting to the ground. Asked whether Russia will invoke its right to self-defence as envisaged in the UN Charter over the loss of its military aircraft on the Syrian-Turkish border, Russian presidential press secretary Dmitriy Peskov replied: "Until there are clarifying reports, it is impossible to answer this question." He said: "So far, the defence ministry has not yet confirmed what brought our warplane down. We know for a fact that the aircraft was in Syrian airspace, above Syrian territory." He refused to confirm rumours that President Vladimir Putin was planning to call an extraordinary meeting of the Russian Security Council following the incident. But he added it is likely Putin may discuss the matter during talks with Jordanian King Abdullah II in Sochi today. BreakingRussian presidential press secretary: Downing of jet "very serious incident"
President Vladimir Putin's spokesman Dmitry Peskov has called the downing of a Russian Su-24 warplane in Syria a "very serious incident", but said it was too early to draw conclusions. The UK-based Syrian Observatory for Human Rights says the Russian jet crashed in the mountainous Jabal Turkmen area of Latakia, where air strikes and fighting between rebels and Syrian government forces were reported earlier on Tuesday. The BBC's Selin Girit says there are reports that one of the pilots has been captured by an ethnic Turkmen rebel group, but this has not been confirmed by independent sources. Some reports are also suggesting that the remains of the plane fell into a Turkmen refugee camp. Turkmen have been fleeing Russian air strikes and the war with President Assad's forces. Turkey has previously expressed concern about the fate of Turkmen, who are ethnically quite close to the Turkish, in Syria. Moscow correspondent Sarah Rainsford tells BBC World there is a key contradiction at the moment in the accounts from Turkey and Russia. She says: "While Turkey is talking about shooting down a plane over its airspace, Russia is saying first and foremost that this Russian plane was in Syrian airspace for the entirety of its flight and it claims it can prove that." Russian state media is also discussing the possibility that the plane was shot down by rebels with a surface to air missile. "That is in direct contradiction to what the Turkish military is saying - that two F-16 fighters made repeated attempts to make contact with the jet which was violating its airspace and then shot that plane down." Video footage shown by the HaberTurk TV Channel shows a burning trail as the plane comes down after being shot down. Russian media asks: Was a surface-to-air missile responsible for downing of Russian jet? There's been discussion in the Russian media about what could have brought the plane down. Pundit Viktor Zabolotskiy, who heads the Federation of Amateur Aviators,told state-owned rolling news channel Rossiya 24 theSu-24 was most likely downed by a manpad (man-portable or shoulder-fired surface to air missile). That view was echoed by Viktor Baranets, military correspondent of the pro-Kremlin tabloid Komsomolskaya Pravda. But pro-Kremlin military pundit Igor Korotchenko told Rossiya 24 the plane was flying at 6,000 metres making it unreachable by a manpad. BBC correspondent Jonathan Marcus has previously reported on how su-24s are vulnerable to manpads. A press spokesman for Nato says it is "in touch with the Turkish authorities" but no further statements will be made for the moment. Video footage of the plane falling from the sky has emerged. It shows it disappearing by trees on the mountains near the border with Hatay province. The Russian defence ministry has confirmed its plane downed on the Turkish border, was an Su-24 fighter jet. Syrian activists have been quoted as saying that one of the pilots of the Russian Su-24 has been captured. He is said to be being held in the mountainous Utayrah area in Turkmen Mount, Qatar-based Al-Jazeera Arabic TV reports. This is exactly the kind of incident that many have feared since Russia launched its air operations in Syria. The dangers of operating near to the Turkish border have been all too apparent. Turkish planes have already shot down at least one Syrian Air Force jet and possibly a helicopter as well. There are conflicting reports as to whether it was ground fire or Turkish jets that brought down the Russian plane. Air operations in the crowded skies over Syria just got a good deal more complicated. The only mitigating factor is that initial reports suggest that two parachutes were seen so the Russian crew at least got out of their stricken aircraft. Diplomatic fireworks ahead! 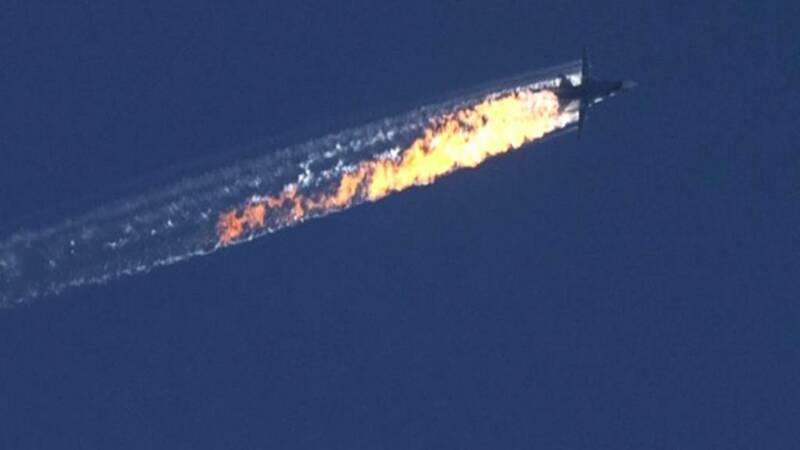 Turkey says its F-16 fighter jets shot down the Russian plane, but Russia says the plane was downed from the ground. The Russian defence ministry has confirmed that its Su-24 fighter jet was shot down near Syria's border with Turkey. Turkey says the plane violated its airspace, but Russia denies this. Russia has said the plane was shot down from the ground, while Turkey says its fighter planes downed the plane. Turkey says they gave 10 warnings before shooting down the plane. Russia has confirmed that the two pilots ejected themselves, but their whereabouts and fate are not yet known. Welcome to live coverage of the developing news story that Turkish warplanes are reported to have shot down an unidentified military aircraft near the border with Syria.